Hope you all had a lovely day! Ours was brilliant, and the best thing? Everyone was well, not a cough or sniffle to be seen! For the mince pies, I used a jar of the mincemeat that I had left over from last Christmas. They look gorgeous :). The Christmas tree looks perfect, what a fun treat! Hope you had a wonderful holiday! First time visiting your site. AND a perfect time- this looks heavenly!! I hope your holidays was a nice one. Glad to hear it was a good Christmas and "yeah!" for no sickies!! I am loving those cookies...so perfect! Glad to hear you had a great Christmas! I love the use of the tree cutter on your mince pies. Best wishes for the New Year. What gorgeous mince pies you made, Nic. That is such a great picture!And a great little tart. Picture perfect! Merry Christmas! And have a wonderful New Year! Glad to hear everyone was well and you all had a good Christmas Nic! Merry Christmas, Nic, and a Happy New Year. Our mince pies were a hit and miss affair, due to having been made by my dad. He over-filled them, stopping the flow of air and thus not cooking the bases properly. But all the other food was really great and there's a lot of weight to come off now! Glad to hear you had such a good Christmas Nic. 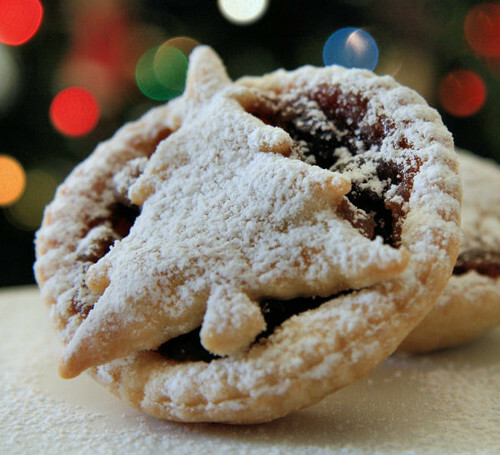 The mince pies look perfect and so festive. It has been a pleasure to get to know you over the past year or more Nic. I'm looking forward to all the exciting and innovative recipes coming from Cherrapeno's kitchen in 2009!!!!! Nic, I've never had mincemeat pie, and what a shame that is, as yours looks amazing. Glad to know your Christmas was as brilliant as you are. A very merry Christmas to you too. I'm glad to hear you had a lovely time. Here's to a food filled 2009! Have a wonderful 2009, too! Sophie - thank you, hope you did too! Joyce - welcome and thanks so much for leaving a comment. Hope you had a nice one too! Tartelette - thanks! Hope yours was sickness free too! Antonia - best wishes to you and yours for the New Year! Anne - thank you, you too! Sunita - thanks! I'm so glad we found each other's blogs. Muralimanohar - I know what you mean. I like them, but not as much as most other things! Raquel - hope you enjoyed yours, your first one as a newlywed! Megan - thank you so much! Anudivya - and to you too!! Hannah - Happy New Year!!! Jan - hope to see you around a bit more when you have finished filming! Aw, bless him, at least he made the effort. I'll be joining you on the New Year diet!!! Deeba - I know, nothing worse than someone off colour! Wishing you all the best too! LyB - aw, thank you. And I am looking forward to seeing yours too! Marysol - thank you, that's so sweet of you. I hope you get the chance to try one. Helen - you too! Bring on 2009! aforkfulofspaghetti - hi there! Wishing you a wonderful one too! the little trees are so cute! Mine had very un origional stars on them! What glorious little mince pies - so pretty! Next year I really have to make some - didn't do any thios year :( And I have to pretty mine up a bit methinks! Anon - vegetable suet is made from fat such as palm oil combined with rice flour. It resembles shredded beef suet, and is used as a vegetarian substitute in recipes, but with slightly different results from animal suet. Suet is traditionally used in mince meat recipes.